SXSW EDU will return March 9-12, 2020 for the 10th annual Conference & Festival in Austin, Texas. Since inception, SXSW EDU has been largely driven by the greater community. This includes everything from programming tracks to session speakers. On Monday, June 24 we will begin accepting session entries for SXSW EDU 2020 via PanelPicker! PanelPicker is the official user-generated session proposal platform designed to enable the community to propose ideas, in a variety of session formats. The entry process takes place over a month-long submission window where you can enter your idea for consideration. PanelPicker will then re-open for public voting, allowing the community to review and help select from the ideas entered. Start thinking about what you might want to submit for SXSW EDU 2020. Stay in the know with the SXSW EDU newsletter or by following us on Twitter, Facebook, Instagram, LinkedIn. 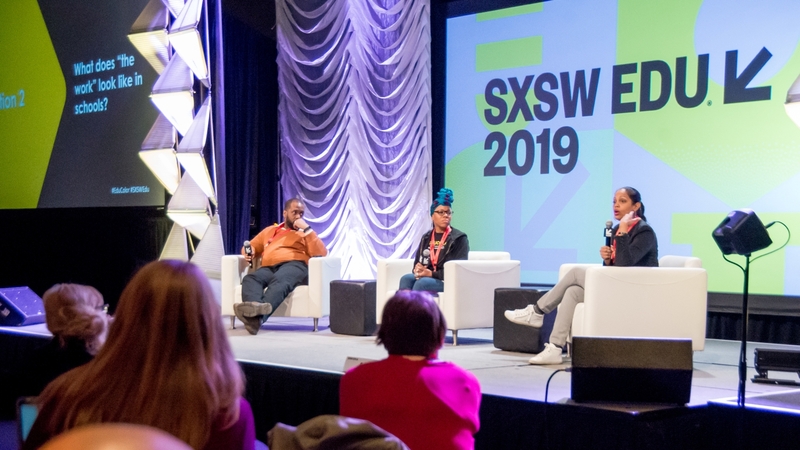 SXSW EDU 2019 panel, Educolor: The Movement for Collective Liberation. Photo by Kara Mosher.